Worldwide, at least 1 million people die by suicide each year and many millions more attempt suicide. However, suicide has been increasingly recognised as a preventable problem in many cases. Because of this, and the rising rates of suicide in young people, many countries have established national suicide prevention strategies. These include the United Kingdom, the USA, Scandinavian countries, other countries in Europe, Australia and New Zealand. There is alsoincreasing emphasis on the treatment of suicidal people and those who have made suicide attempts. In order to be effective it is imperative that strategies for treatment and prevention are based on sound scientific evidence. 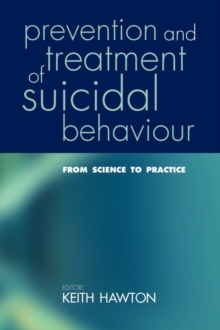 In this book leading figures from psychiatry, psychology, epidemiology, public health, and social medicine bring together the research evidence concerning the key elements in suicide prevention and treatment of suicidal behaviour and translate it into implications for practical action. This includes social and public health policy as well as clinical practice. The book draws together the evidence relevant to treatment and prevention, and uses this in order to highlight the most effectiveapproaches. The range of initiatives covered is wide, reflecting the complex nature of suicide and hence the need for a range of approaches. This book will be an essential source for anyone concerned with the design and implementation of effective suicide prevention strategies, including clinicians workingwith individual patients, strategic policy makers, and researchers.